Word on the street at the time of my opening the decant vial of Or et Noir was that it had amazing strength and projection. Why I didn’t listen to good advice is anybody’s guess. It knocked me off my feet. In a good way though. In Bottle: Sharp rose up front. Very strong and overwhelmed my nose as I, foolishly, whiffed instead of wafted. Applied: After waiting out the initial knockout punch delivered by my whiffing, I tried her on. You need very little of Or et Noir because 1) The stuff I had was in parfum concentration, and 2) It’s strong no matter how you dress it up. The rose is immediately noticeable, heady and dense and rich. I felt like I was projecting so much of this that someone could be standing on the other side of the room and still smell me. It’s quite a bit intense on first application but it grows more complex and settles down during the mid-stage where the other florals spring up like–well, flowers in a garden. Lilac and geranium help temper the rose a bit and there’s a bit of spiciness lent by the carnation to draw the complexity out of the scent. The rose is still the star of the show and remains the star throughout as you head into the dry down with a slightly earthy, soft scent covering the background as the rose rolls through. Extra: Or et Noir was released in 1949, making it a Caron classic. I don’t know how anyone can get a hold of this fragrance now aside from asking around at Caron boutiques. Design: I’ve only ever seen the extremely fancy crystal flacon of this stuff. Now, seeing it and touching it and using it is another matter as I have yet to do any of those things. It sure looks expensive, delicate and extremely luxurious though. Notes: Rose, lilac, carnation, geranium, oak moss. I’m not sure I really like this interpretation of rose more than my current top pick (Mahora by Guerlain) but it’s lovely. I just wish she was wearable from the get go instead of having to wait for her to settle down a bit. 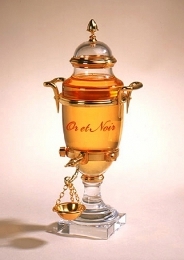 Reviewed in This Post: Or et Noir, ~1970, Parfum. This entry was posted in classic, floral, Reviews By House and tagged carnation, geranium, lilac, oak moss, rose. Bookmark the permalink.